We had such a great March vigil – thanks to all who came out. It was somewhat difficult to do a head count as we had so many Catholics on the sidewalk! About 36-38 of us who came from Mass at St. Thomas Aquinas to Latrobe were met by a group of approximately 20 parishioners from St. Michael’s in Gastonia. While we were praying, there were also other Catholics doing sidewalk counseling – the Griffin family from St. Patrick’s and the Harrison family from Sacred Heart. Also present was a group of about 4-6 people praying the rosary in Spanish. That’s what it’s all about! Catholics in action spiritually fighting against perhaps the greatest evil of our generation, culture, and nation. There were also others on the sidewalk from various ministries including the Pregnancy Resource Center in Charlotte. Our prayer and presence supports them as they reach out to the mothers and fathers walking into the clinic – to offer immediate help to anyone who would dare to choose life. On our way back to our cars to head to the church for Benediction, Fr. Winslow talked with us for a few minutes as a group about the nature of spiritual warfare that exists behind the scenes in this culture of death. He reminded us that we are there to fight for the people who are trapped in the great lie and spiritual darkness that is abortion – including the workers and protesters who try to silence us as we pray. 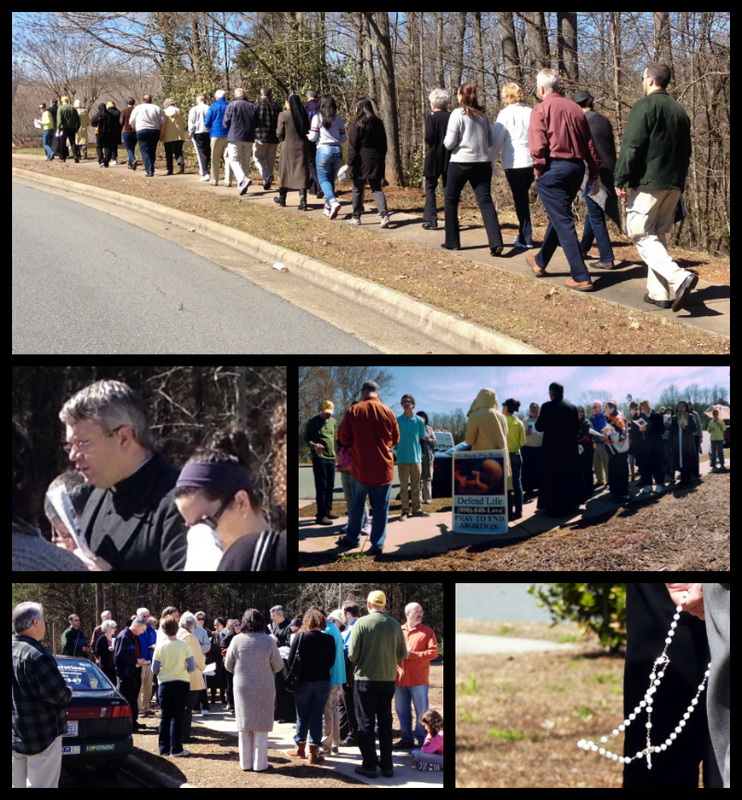 What a wonderful day to see so many faithful pro-life witnesses from a variety of parishes in our diocese! We hope for another great turnout next month. We’ll be meeting at St. Vincent de Paul and praying at Hebron with Fr. Shaw – check out the vigil schedule page for details. Thank you to all who came out to our February 22nd Vigil at St. Ann’s (even while the rosary congress was happening nearby)! 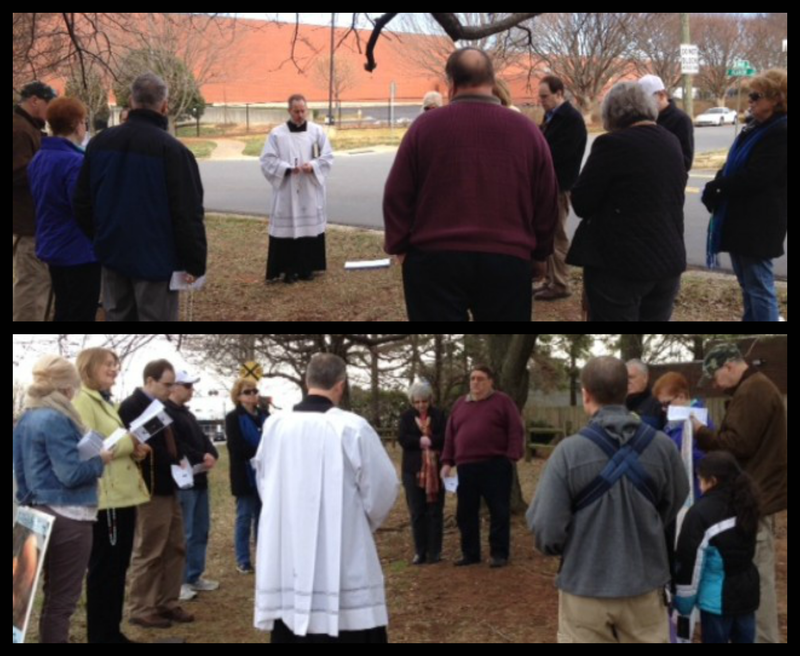 Following Mass, the group prayed at the Hebron abortion clinic with Fr. Reid (see photos below). SAVE THE DATE: Our next vigil will be Saturday, March 8th at St. Thomas Aquinas parish: 10am Mass followed by prayer with Fr. Winslow at the Latrobe abortion clinic. We will pray for a short time then meet back together at the parish for Benediction. See you then! Please share this with friends, family, and fellow parishioners this special and powerful monthly opportunity for Eucharistic-centered, pro-life prayer with our diocesan priests at our local abortion clinics.